Let the near-constant sunshine and warm ocean breezes lull you into the Emerald Coast spirit at our beautiful single story cottage “Beach Sea-Sun”. 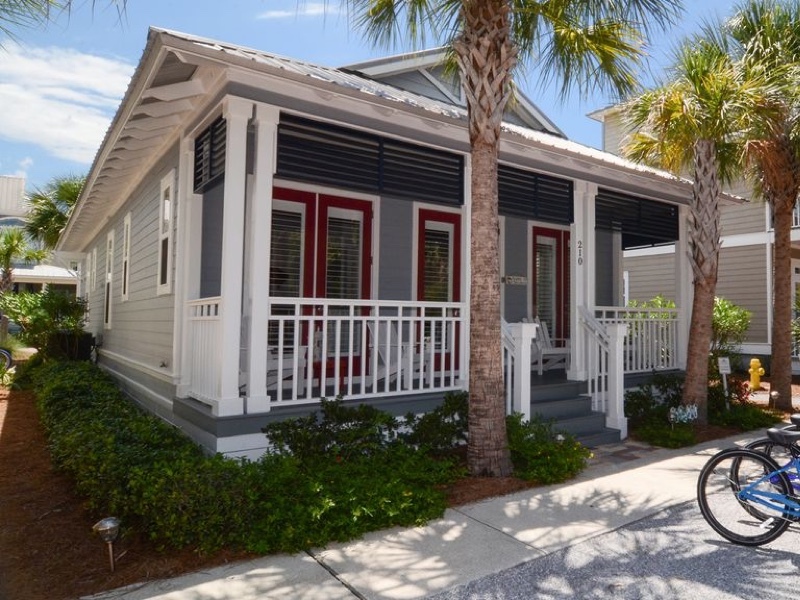 Nestled within the resort community of Seacrest Beach this charming 3 bedroom, 3 bath oasis is ready to deliver an unforgettable vacation experience. Perfectly laid out, the main room is an ideal spot for entertaining and socializing with family and friends. The open-plan living, kitchen and dining spaces are unified by hardwood flooring, soft coastal colors and three sets of french doors that fill the rooms with light. A comfortable sitting area boasts plush furnishings and built-in bookcases housing a large, flat screen television, books and games for everyone’s enjoyment. The fully equipped kitchen has both a practical breakfast bar and a separate dining table with seating for six. Each of the home’s three carpeted bedrooms seamlessly incorporate classic elegance with lush décor in serene seaside hues. Two master suites flank the back of the home, each furnished with a king size bed and their own ensuite spa-worthy bathroom. The third spacious bedroom features a twin over full bunkbed which can accommodate up to three children. The third bathroom with a large walk-in shower and built-in bench is located directly across the hall from the bunk bedroom. Known for its stunning white sand beaches and emerald waters, let the lapping ocean waves and the rhythms of the coast sweep you away. The laid back beachside culture of Scenic Highway 30A welcomes you to experience life to the fullest. Ride bikes on the many miles of trails, bask in nature’s beauty at the coastal dune lakes which dot the landscape or satisfy your culinary and shopping delights at the multitude of locally owned and operated shops and restaurants. However you choose to explore, start your vacation at Beach Sea-Sun for the ultimate 30A experience!